RevK®'s rants: Are we living in a simulated universe? One of the ideas that has been suggested is that maybe we are living in a simulation of some sort. Indeed, the theory goes that within any real universe one can create multiple simulated universes, so the number of universes that are simulated must be more than the number that are real. This means the probability that we are in a simulation is more that 50%, well more than 50% in fact. Probability is all very well when you are talking of flipping a coin or rolling a dice, but it does not work so well for considering a game with only one throw ever, a throw you have to take. We don't get to experience 1000 universes and then say "oh look, 84% were simulated". Whatever universe we are living in, it is what it is, and that is a matter of fact. However, it does raise some interesting thoughts on the matter, and scientists are (I believe) even trying to work out how we could find out. But even if we are in a simulation, what does that mean? One possibility would be that the universe is simulated at the level of the sub atomic particles and energy, a simulation run from the big bang onwards following simple rules of physics. This has a certain elegance, in that the programming is relatively simple - it needs the basic constants of the universe and the laws of physics programming in and nothing more. The down side is it means tracking every interaction of every particle and energy in the universe. Something which we have to see as inconceivably big and impossible. However, we are only looking at things from the inside, from our view of scale. We have no idea what the real world may be like. It could be that in the real world, a simulation of that complexity is a simple child's toy - you tinker with the constants of the universe, and press go, wait a few seconds for 14 billion years of simulation to run, and get points for how many planets are left. We have no way to know. This does, however, raise some interesting philosophical questions. The world appears to operate in a consistent way based on a set of rules and constants. From that we can see we can work out how everything from atoms to galaxies formed and how evolution led to the complexity of our own brains and the emergent behaviour that is our self aware consciousness. There are many unknowns in that, but we are fitting the pieces together every day. How would that process be any different if it was a simulation rather than the universe running it live? Would we be any less "real"? I personally think not. A slightly simpler idea is that the universe is not being simulated, but just us, this solar system maybe, with the stars in the sky being just a very sophisticated back drop giving us clues of a wider universe. Even if the simulation is down to the sub atomic particles, the scale is more manageable. Of course it is still inconceivable to us, but it is a much smaller scale than simulating the whole universe. Another possibility is that the simulation does not actually run a game of sub atomic particles in the hope that intelligent life emerges. It could be at a much higher level. If we, as self aware entities, are in fact artificial intelligence modules in a simulation, then the simulation is easier. Well, easier in scale and much more complex in programming. The rules for sub atomic particles are basically simple (even if we don't know them all yet). But the rules for how objects and chemicals and people behave are much more complex to simulate. The good news is you only have to simulate what the NPCs (us) actually see and do - you don't have to simulate the universe or even the solar system. It is even possible that we live in a set of undefined laws of physics that are made up as we go along. When we first made the large hadron collider, or made the first atomic bomb, it could have caused an exception, stopped the game, and waited for programmers to write a module to simulate what would happen. They may only then decide what laws of physics they think should apply. This may seem a tad far fetched - how can you manage to create such a perfect simulation. After all, look at the "physics" in many games and it is laughable. But you have to remember we grew up in this, and we only see this. To the real world our laws of physics may be just as laughable. I also see this as a very real possibility within our grasp. I don't mean a simulation that would fool us, I mean a simulation that would fool scentiant artificial intelligence modules in a game. Creating proper AI, that is self aware, is not that far off, I am sure. And once that happens then the NPCs in games will be loaded with scentiant AIs. At that point you need to decide if you want them to know they are in a game or not. If not, you need to make what they see - the simulation - good enough to fool them that they are in a reality they can believe. That could be us! We could be the NPCs. 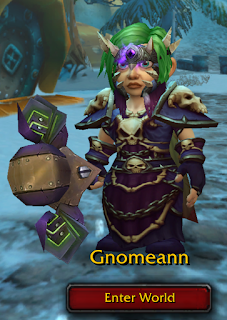 Where Gnome Ann has gone before? Of course, if we are the NPCs, where are the players? A simulation does not have to have real players, obviously, but if you made a game this good, would you not include a way to take part in the game? Of course, we could be the players. We could have an existence in the real world and be playing a game. We see this in the Matrix, where you are born to the game. Equally, it could be that having no memory of the real world is part of how you play the game. Maybe yesterday you were out of the game drinking coffee somewhere and don't remember it. This brings me to the ultimate question of the simulation idea. Maybe I am the only player! This would make the simulation easier - you only have to simulate a few hundred NPCs for direct interaction, and the rest are way easier as they are on TV or over email, etc. It could be that this is my game. If that is true, I am the only one that can try and see the cracks - those scientists looking will be programmed not to find anything. At the end of the day, even if this is a simulation at any level, we may not be able to find out. Even if we do, if it is a high level simulation, it is easy to simply restore from yesterday's backup after fixing the bug, and continuing the game with nobody having found out. P.S. We can't be NPC AIs because we have to poop. There is no reason to make NPCs poop, ever! P.P.S. The existence of the NPC called "Trump" may be proof it has to be a game. If it is a simulation.. there might be a rowhammer style flaw in the substrate. Wouldn't that be interesting? Greg Bear had a similar idea in a piece of mathematics that would function differently under simulation in the novel Eon (which also enabled 'breaking out'/affecting the simulating level from inside). Greg Bear did it more than once. In _Blood Music_ (the novel, not the rather better short story), the laws of physics adjust to fit the experiments being performed. If you perform too many experiments, reality has no room to shift, and gets quite unhappy. Elon Musk suggested there was a one in a billion chance we are in base reality and I lean towards agreeing. One just has to look at the hockey stick of computing power in the last 50 years that has brought us towards tech that can fool our brains into believing we are somewhere else.. Fast forward that by just a few more decades for complete immersive simulation, then just to think about what 10k years of advancements could bring. I love games like Elite Dangerous.. 400billion simulated star systems that you can explore with thousands of other players (or alone)... In VR and I really should grab a copy of No Mans Sky for its infinite procedurally generated Galaxy. Specifically the paragraph starting "The argument I’d make hinges instead on certain thought experiments"
as Nick says above, a lot of these possibilities have been teased out in fictional form by Greg Egan. is like at all, for certain. Why don't you have more time? Well our simulation has a current bug that needs fixing in the delayed choice quantum erasure experiment! How many times do we have to explain it? More mis-selling from Sky Q?